Get on the right track with the new Model 2550 Track stump grinder from Bandit Industries. The introduction of this machine marks Bandit’s entry into track-mounted stump grinders in the 40-hp category, combining the popularity of the Model 2550XP self-propelled stump grinder with the versatility and go-anywhere mobility of a track-mounted machine. A standard swing out operator’s station places all machine controls to the side of the machine, giving operators a clear view of the work area. A wireless radio remote with tether back-up is a popular option for those who prefer to be located away from the machine while grinding. 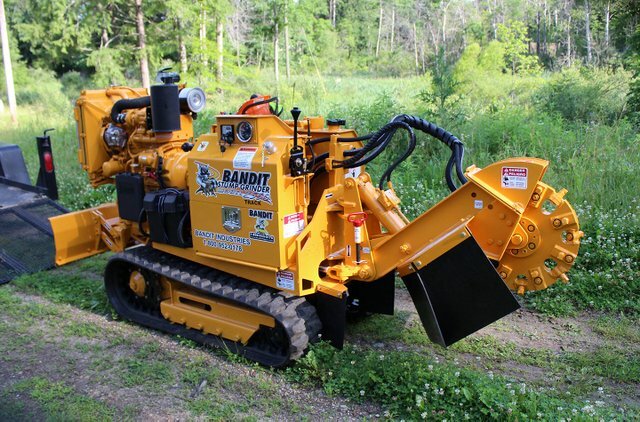 All Bandit stump grinders, including the Model 2550 Track, are built with a solid chassis construction using continuous steel welds. This results in a tougher, more durable machine capable of years of reliable service for dedicated stump grinding professionals or rental companies. The Model 2550 Track features a beltless hydrostatic direct-drive, delivering smooth, direct power to the cutter wheel while reducing maintenance downtime and costs associated with traditional belt drive models. The Revolution cutter wheel comes standard, delivering exceptional cutting power and chip containment for easy clean up. For more info, visit www.banditchippers.com or call at 1-800-952-0178.